George Galloway, the leading figure in Respect, has grabbed a remarkable victory in the Bradford West byelection, claiming that “By the grace of God, we have won the most sensational victory in British political history”. 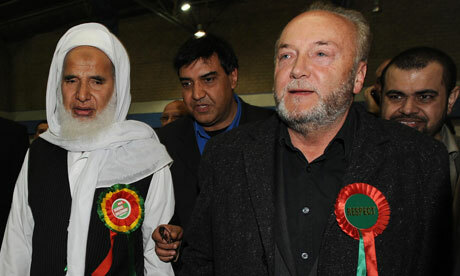 It appeared that the seat’s Muslim community had decamped from Labour en masse to Galloway’s call for an immediate British troop withdrawal from Afghanistan and a fightback against the job crisis. On a turnout of 50.78%, Labour’s shellshocked candidate Imran Hussein was crushed by a 36.59% swing from Labour to Respect that saw Galloway take the seat with a majority of 10,140. The War Is Over. Start Packing! We got our man. Wave the flag, kiss a nurse (or a sailor) and start packing the equipment. 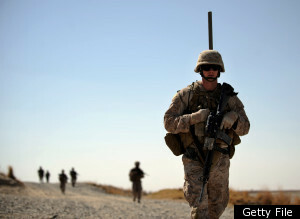 It’s time to plan to bring all our boys and girls home from Afghanistan. When the tenth anniversary of the 9/11 attacks rolls around, let the world see that we are on a clear path to bringing home our troops from Afghanistan and handing back sovereignty to the Afghan people. With more Sherlock Holmes than Rambo and judging from press accounts, not much role for the 100,000 US troops in Afghanistan, US intelligence tracked Osama bin Laden to a safe house in a well-appointed suburb of Pakistan’s capital and a small US force raided the compound. Press reports say Osama bin Laden was killed in a firefight in the compound and that his body has been buried at sea, in accordance with Islamic tradition that expects a burial within 24 hours. Success typically has many authors, and I don’t doubt the ability of some to argue that our occupation of Afghanistan has contributed to this result. Perhaps, it will turn out that some prisoner captured in Afghanistan by US forces contributed a key piece of information that helped investigators find bin Laden’s compound in Abbottabad, Pakistan. Our economic and political mess became more clear once I realized that most of the important political deals take place in the Mos Eisley Cantina. You know the scene from the first “Star Wars” movie in 1977: a dark, smoky bar located somewhere in a twilight zone: a liminal and lawless hideout where the ethically reprehensible is the norm. We know our elected officials don’t do their political work up in the daylight of our world, because none of the big ticket laws they pass have anything to do with what the majority of our citizens want. There are differences between the two political parties, but they’re differences of degree, not kind. How can it be that the people we elected to serve us routinely sell us out to the highest bidders? The majority of our citizens want our soldiers brought home now. As John Kerry said to our House Foreign Relations Committee in 1970 about the ongoing Vietnam War: “How do you ask someone to be the last person to die for a mistake?” Today’s answer seems to be that members of Congress do it without much genuine emotion, because wars – whether right or wrong – are immensely profitable for some of the corporations whose lobbyists woo our representatives in dark places. And few if any of their children are going to be in those wars.